Looks good! Thanks for posting that. Damage Resistance (Poison, Shock, Magic, Frost, Fire) for the first five. Either Chameleon or Invisibility. I'm going to guess Invisibility. And I have no idea about the eyes, but it'll probably be obvious once I look. I think the resistances on the right should have the same color of the "shield" and just the color of the "arrow" should change. Id keep the blue shield variant personally. I dunno - I think maybe change the shield colour to an elemental opposite, but Daggerfall doesn't quite have that. Im still doing the menu/hud work, and found out this image will be hard to upscale correctly. Maybe you would enjoy drawing these anew one day... no prob if you decide otherwise. Ive put together small sheet with icon descriptions so you can see for yourself. Yeah for sure. I was thinking about it earlier, however never got chance to tackle with it (wuz doing icons). I think Im done with the icons...for now. We have them enough for starters. But yea those ones for the spell making hud, that could be interesting. The only thing I cant say when, since Ive increasingly having less available time for this. Ill post them here one by one as make them ofc. PS -thanks for the graphics -this helps a lot! Thanks for considering it mate! 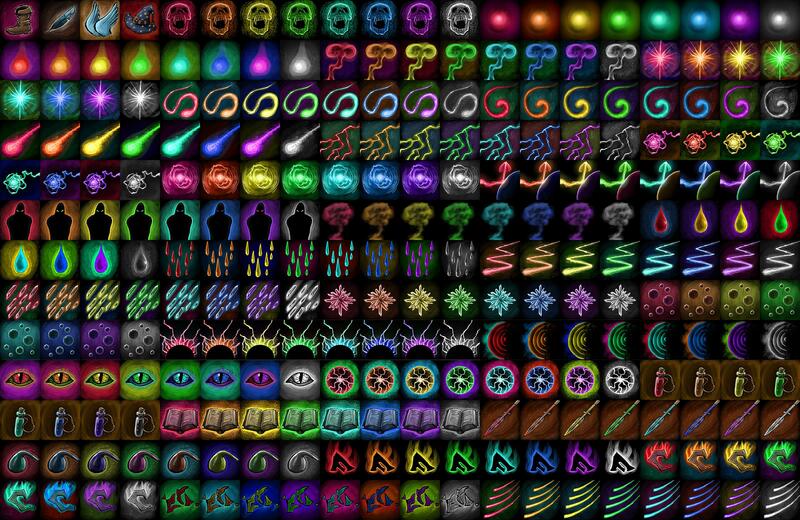 So, here is v0.1 of VMblast New Spell Icons with my recolors. I've seen the comments on the shield icons and I might make the changes later this week. Last edited by Alyndiar on Wed Jan 23, 2019 2:24 am, edited 1 time in total.